Hero Arts Fancy Dies WINDOW ON LOVE CONFETTI DI483 at Simon Says STAMP! Success, Hero Arts Fancy Dies WINDOW ON LOVE CONFETTI DI483 has been shared! These intricate dies are stand-alone cutters that produce beautifully detailed paper-cuts. 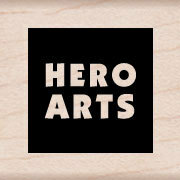 They work well with the Hero Arts line of stamps and papers.